A passionate Production Designer from Ulverston received funding to complete a Master’s Degree at a specialist London Art School. 31 year old May Davies received £500 from the Cumbria Cultural Fund to support her through an MA in Theatre Design at the Wimbledon College of Art. The grant allowed May to access shows and exhibitions, visit theatres and buy materials for model making. May was introduced to the exhibition sector at the age of 14, when she worked at the Brewery Arts Centre in Kendal. She went on to study Fine Art at Oxford Brookes University and then moved back to Cumbria. 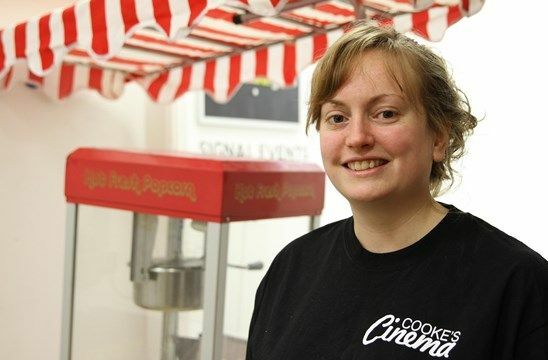 May worked for Signal Film and Media, a charity in Barrow that provides accessible film and creative media activities to people from all backgrounds. She also worked in the art department on short films made for the UK Film Council and Creative England. Credits include the BBC film, Swallows and Amazons and the ITV series, Safe House. May combined her love of set design with her devotion to community engagement for her MA research proposal. She researched the extent to which production design contributes to the accessibility of theatre and film productions and if this increases diversity within the industry. May hopes her Master’s Degree will allow her to give something back to the community. She plans to continue working as a professional alongside passing on the knowledge and skills she has gained by delivering workshops to inspire the younger generations. May said: “This opportunity has hugely grown my confidence in my own ability and the ability of the arts to promote positive change in people’s lives. The course has equipped me with more knowledge and skills that I can bring back to working life in Cumbria.